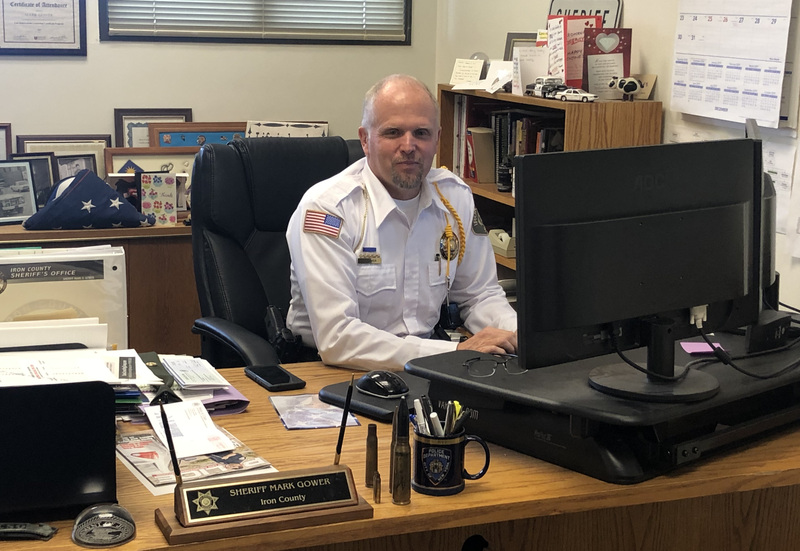 CEDAR CITY — For 16 years, Iron County Sheriff Mark Gower has started his work day with the words “Work hard, stay humble” posted on a plaque that hung on his office door. For him, it’s a motto he has always lived his life by. It’s not just the door hanging reminding Gower to maintain his humility that he has included as part of his office decor; he also has plaques and pictures that reflect his love of country and his commitment to uphold the oath he took when sworn in as a peace officer 26 years ago. On one wall hangs a framed copy of the Constitution, a constant reminder of the promise he made to the people of Iron County to protect their civil liberties. Next to it hangs a painting of a soldier in prayer on the battlefield with his men surrounding him, an image that mirrored some of Gower’s most private moments with his deputies during times of potential danger. On the opposite wall hangs the Pledge of Allegiance with a plaque next to it that includes a quote by President Ronald Reagan: “Freedom is never more than one generation away from extinction. We didn’t pass it to our children in the bloodstream. It must be fought for, protected and handed on for them to do the same.” And on Gower’s filing cabinet is a folded retired flag – all a display of the sheriff’s American pride. But on Jan. 2, 2019, the walls that once hung his plaques and awards affirming his courage and leadership will be bare. The shelves that now display thank-you cards from children who have toured the building and the souvenirs given to him by supporters will be empty and his desk void of the paperwork, notebooks and a 50-plus coin collection gathered by various law enforcement agencies throughout the years. 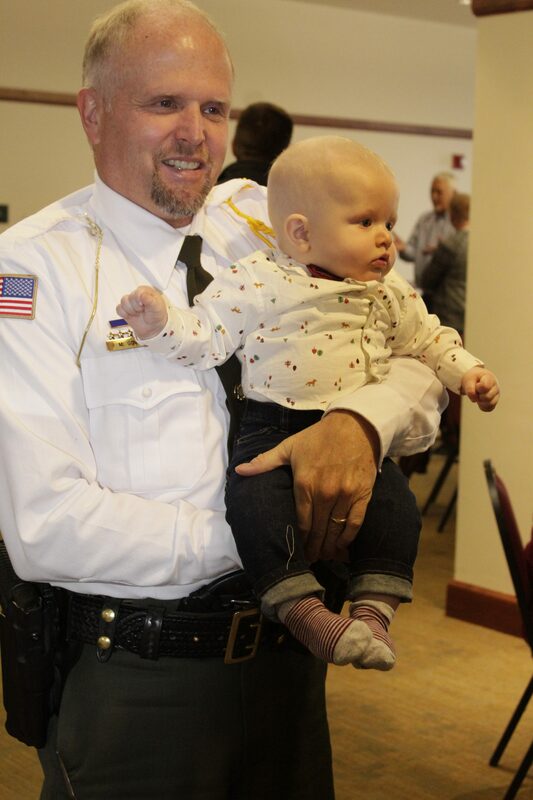 In two weeks at noon, Gower will make his last call to dispatch, ending his final shift with the Iron County Sheriff’s Office. But it won’t be easy. He has been an employee of the sheriff’s office since 1993 when he first hired on as a deputy after receiving his peace officer certification. 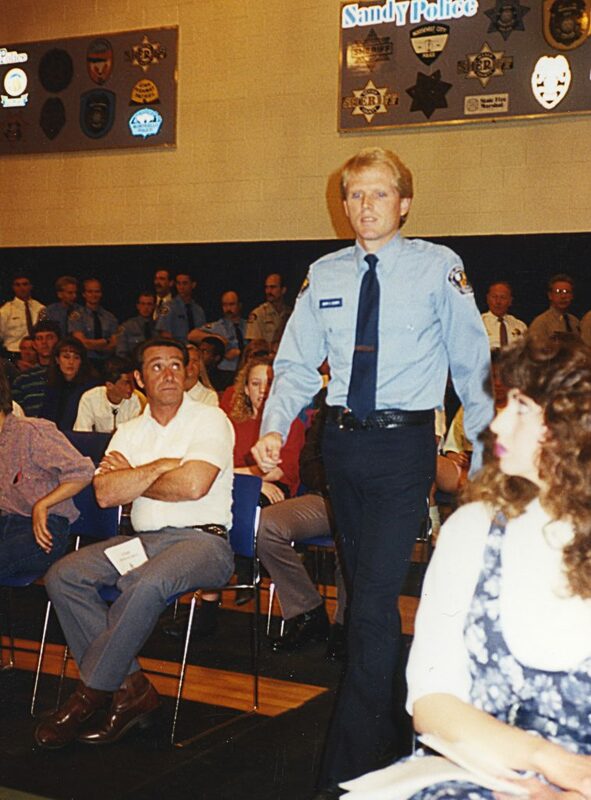 Gower went on to serve as a task force agent, detective and later the sheriff in 2003 when he was initially appointed to fill the position after the former administrator was forced to leave office early. The feelings aren’t one-sided either. 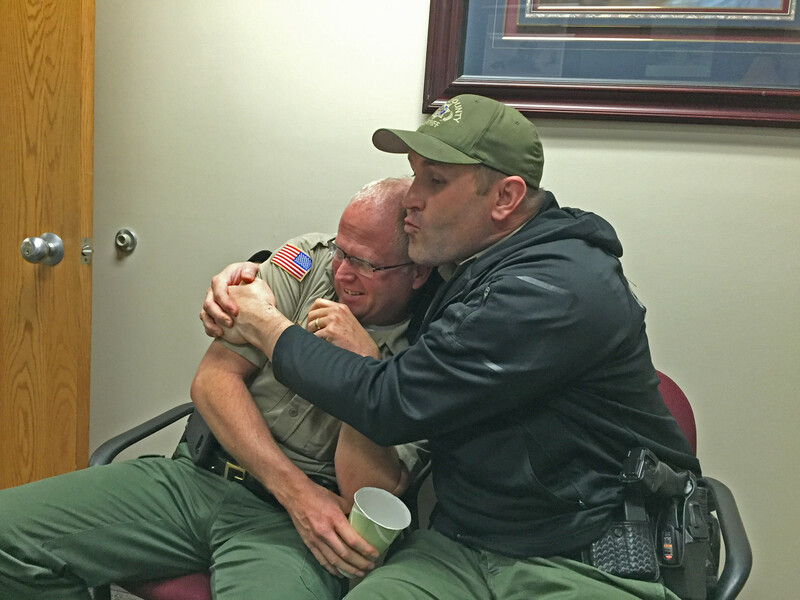 During Gower’s retirement party Friday, many of his deputies struggled to hold back the tears as they knew it wouldn’t be long before they had to say goodbye. For Lt. Del Schlosser, who has served with Gower for more than 20 years, the thought of not having him just around the corner from his office to holler at during the day is hard to fathom. Besides his belongings, Gower is retiring with a host of memories, and in 26 years there’s plenty of time to make some real great ones that bring a lot of laughter and joy. One of the moments Gower still laughs about was a call he received one night about his deputies responding to a scene with what had been reported as a dead body. Dressed and in the truck ready to roll out for assistance, he received a second call, this time his guys were laughing uncontrollably. It took about five minutes before the crew was able to gather themselves enough to tell the sheriff the man they had presumed dead was not. Gower said the most rewarding part of the job by far has been the times he’s been able to help “make someone’s bad day, a good day.” It is the small things that were important to him, like not writing someone a ticket – which he didn’t do a lot – or bringing fuel to someone who ran out of gas. He was also known to often go out of his way to check on a victim or someone who had lost a loved one to just make sure they were OK. This side of Gower that can laugh at innocent and harmless mistakes – even his own – or get his hands dirty by changing someone’s tire while dressed up in uniform is what many who know him refer to as his “human side,” something others so often found endearing and admirable. Still, while there is a lot for Gower to smile about, there are memories he retains that will forever haunt him – specifically the ones involving the abuse and the death of children. Those bring tears to his eyes even to this day and can keep him up at night remembering them. Elections also took a toll on Gower and his wife, Traci. They agree the political warfare waged against the sheriff at times was taxing and won’t be missed as they move in to this next chapter of their lives. Leadership, however, came easier. Gower was never a sheriff who only dealt with the administration side of things, dictating and directing his deputies from his desk. For him, it was always hands on and serving alongside his people. When the deputies were required to do something, Gower held himself to the same standards. 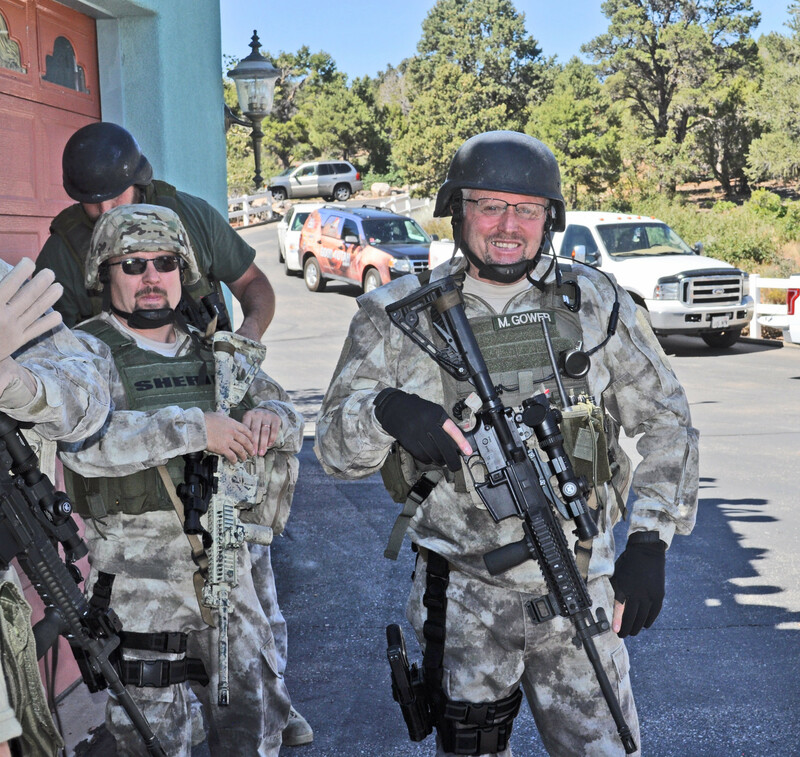 He never expected anything from anyone he himself wasn’t willing to do, as evidenced by his commitment to finish a training mandated for those serving on the SWAT team. Often referred to as “hell week,” the program consists of 100 hours of difficult exercises, workouts and drills all done within five days, leaving only about three to four hours in every given 24-hour period for sleep. 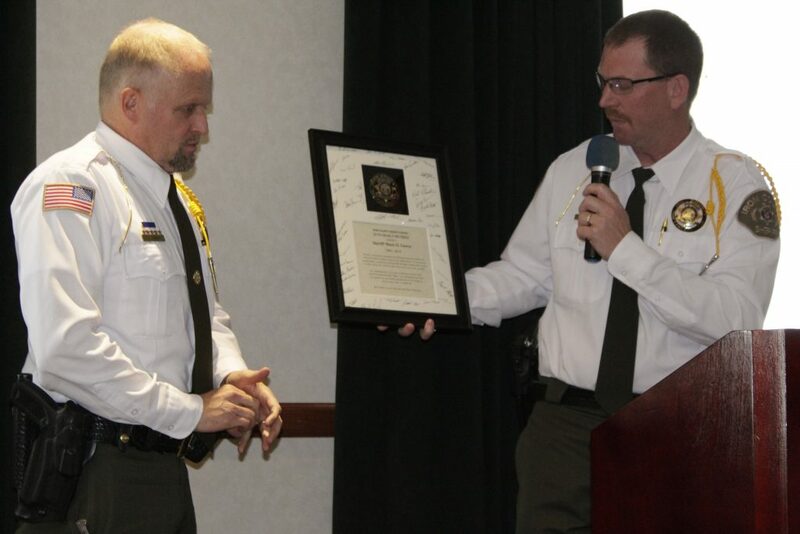 Gower finished the training in 2014, receiving the Officer of the Year award that same year from the Utah Peace Officers Association, in part because he is the only sheriff in the state to have ever have attended the training. His leadership has also been apparent in how far he has taken the department during his tenure as sheriff. Gower admits he is proud of how far the sheriff’s office has come under his direction, but he doesn’t take full credit. Instead, he points to his team as being responsible for the changes. Integrity has also been something Gower has maintained while holding the highest elected office in the county, a word often used by his deputies and others to describe him. Tracie Gower said she has never questioned this even after 20 years of marriage. While Gower is leaving the Sheriff’s Office, he isn’t planning on retiring anytime soon, as he just recently accepted a job as a police officer with the Colorado City Marshal’s Office in the border towns of Hildale, Utah, and Colorado City, Arizona. Great Sheriff and an even better person. He will be missed for sure! Wish him the best in all his future endeavors.